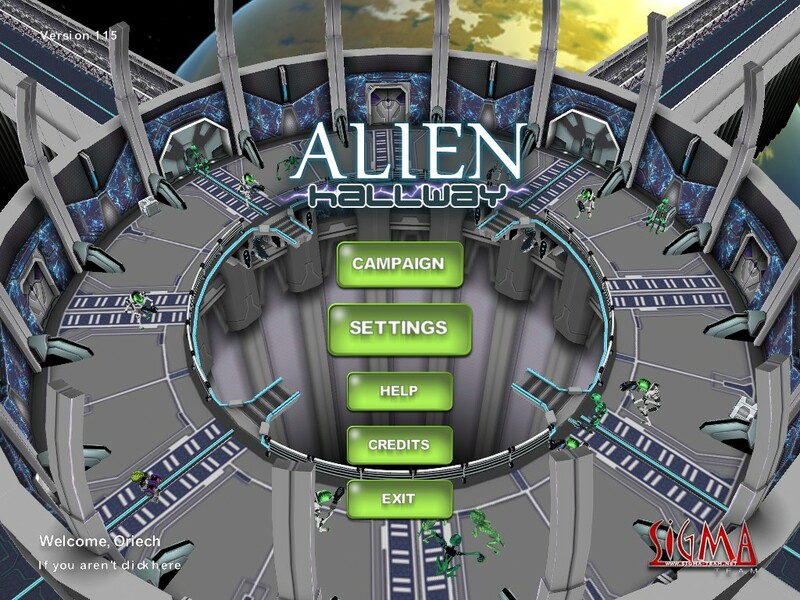 Alien Hallway is a tower defense game developed by Sigma Team Inc. Being one of my favorite genres, it immediately caught my attention. Don’t get me wrong though. 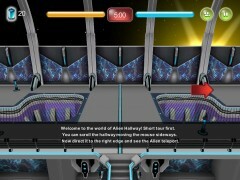 Alien Hallway isn’t your average tower defense game. Sigma Team put a little twist on the gameplay, which I’ll delve into later, that will probably make it more appealing to the casual gamer. Alien Hallway looks pretty good for what it is. 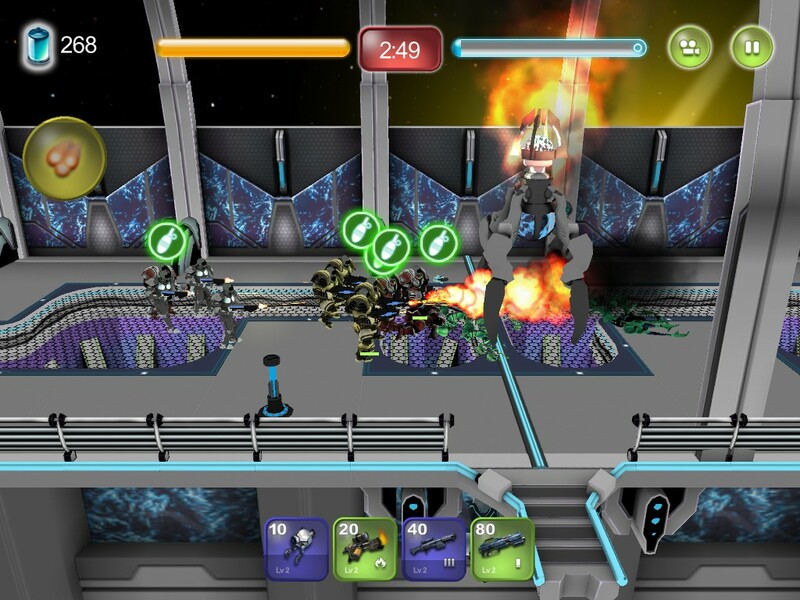 When it comes to tower defense games, graphics aren’t necessarily important. It’s all about the gameplay, at least for me. Each of the troop classes have their own individual skins, though with five or more of the same on the screen, they start to bleed together. Every level is the same setting, just different in length or type and number of baddies. 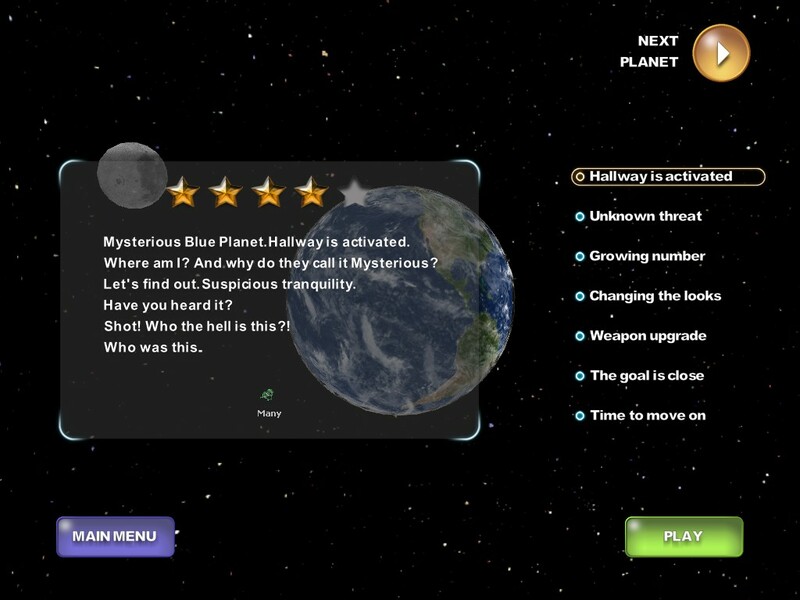 The major gripe I had here was the awkwardly worded tutorial screens. Gameplay, where it’s at. 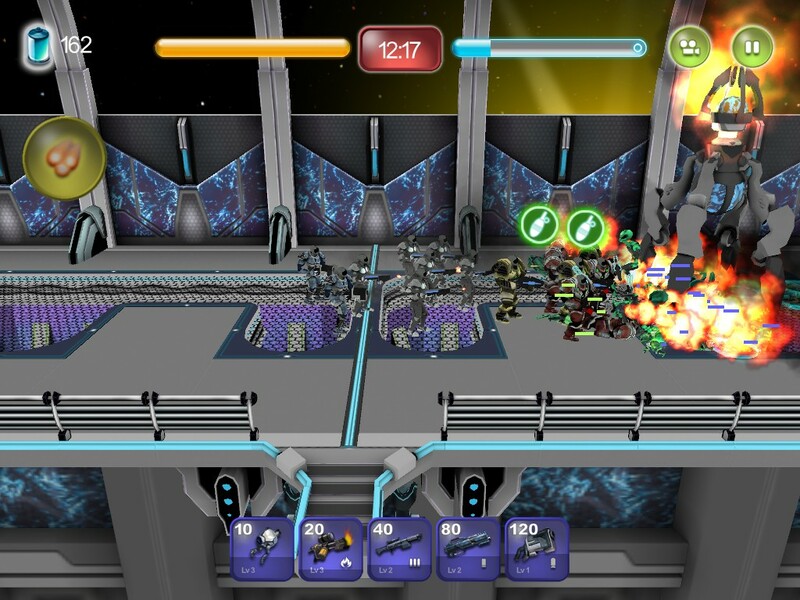 As I mentioned earlier, Sigma Team Inc. took the average tower defense game and twisted it a little; in this case, simplifying it. Instead of the usual maps with tower placement stations, allowing you to alter the enemies’ path, as the game name implies, each level is just one long hallway. Your troops (Engineer, Rifle, Sniper, Shotgun, Grenadier, etc.) on one side, aliens on the other. 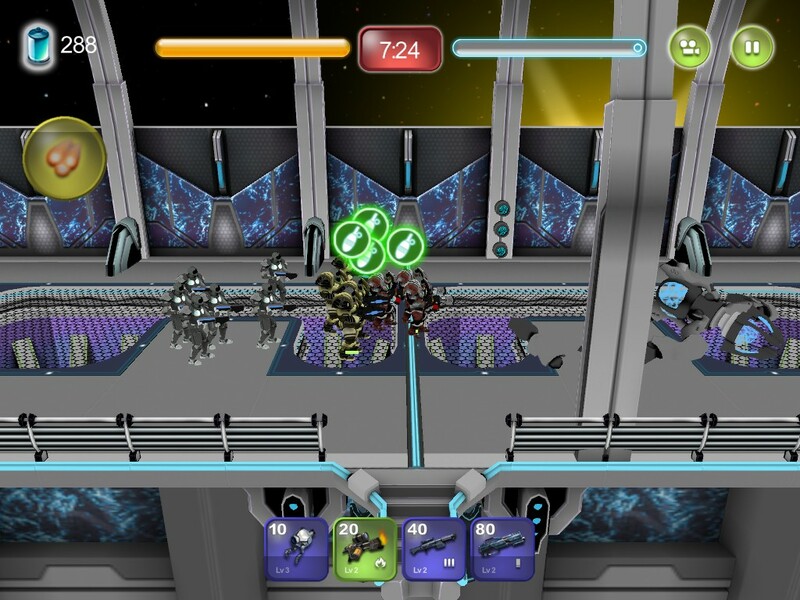 Both sides make their way toward each other, finally converging and battling it out, effectively decreasing the strategy component exponentially. 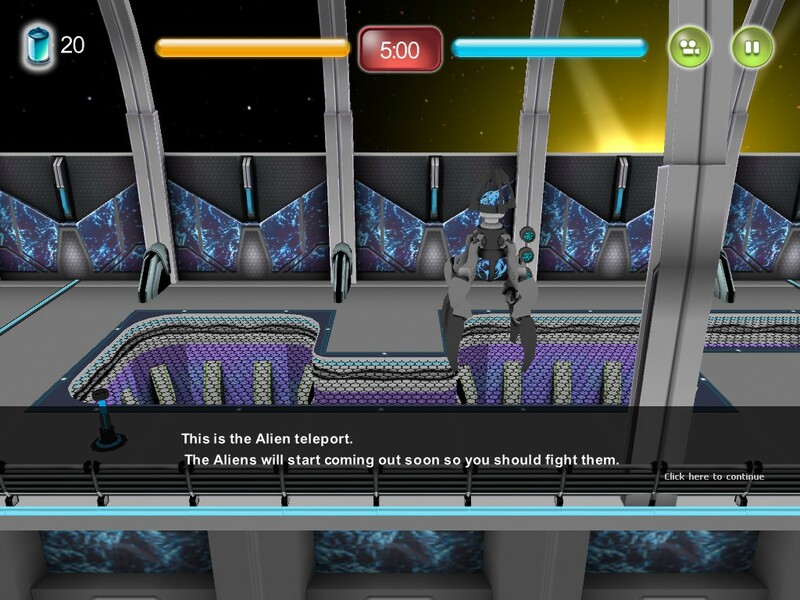 The goal is to destroy and force the marching aliens back enough to reach and destroy their teleporter on the opposite. As you complete missions, you gain cash to buy upgrades for your troops, powerups, and rewards. The troop types don’t seem to differ much when it comes to weaknesses aside from HP, but each troop has a different attack, some even an ability. Riflemen have their rifle, but can also toss out a grenade every so often. Just click the troop’s icon to deploy and another will be sent out onto the battlefield. Once you have enough resources and the troop has “recharged”, rinse and repeat. The enemies are similar. Varying types of enemies with varying levels of HP and different attacks / abilities. Not much to complain or praise when it comes to sound. 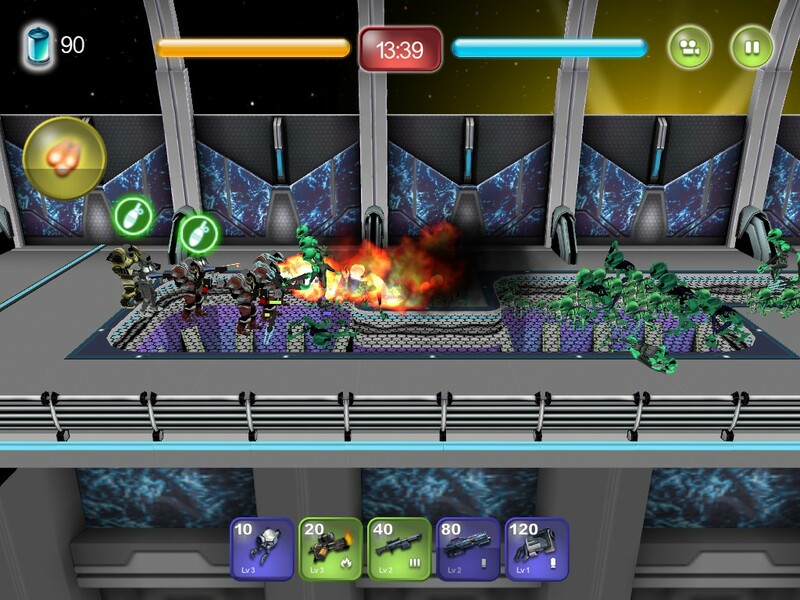 The background music and effects suit the game, but being a simplified tower defense game, they don’t stand out too much. 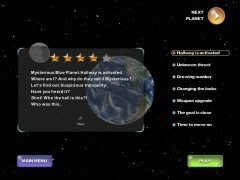 as an army of humans, going from planet to planet to defeat an alien race before it’s too late! All in all, Alien Hallway is a new, simpler take on the tower defense game. It would work beautifully as a flash or mobile game, or even in Google+’s new game stream. For $10 on steam, it’s not a bad purchase to make for any fan of the genre. 7.2 / 10: Simple controls and easy gameplay makes the game very appealing to newer or casual gamers.